68. 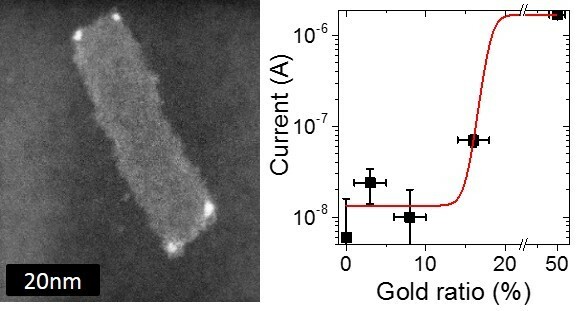 Halide Ligands to Release Strain in Cadmium Chalcogenide Nanoplatelets and Achieve High Brightness, M. Dufour, J. Qu, C. Greboval, C. Méthivier, E. Lhuillier, and S. Ithurria, ACS Nano (2019). 67. 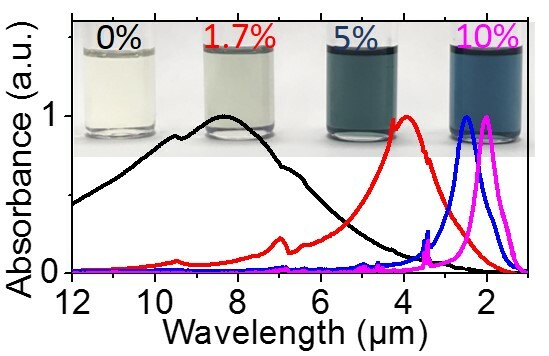 Transport in ITO Nanocrystals with Short- to Long-Wave Infrared Absorption for Heavy Metal-Free Infrared Photodetection, J. Qu, C. Livache, B. Martinez, C. Gréboval, A. Chu, E. Meriggio, J. Ramade, H. Cruguel, X. Zhen Xu, A. Proust, F. Volatron, G. Cabailh, N. Goubet, E. Lhuillier, ACS Appl. Nano 2, 1621 (2019). 65. 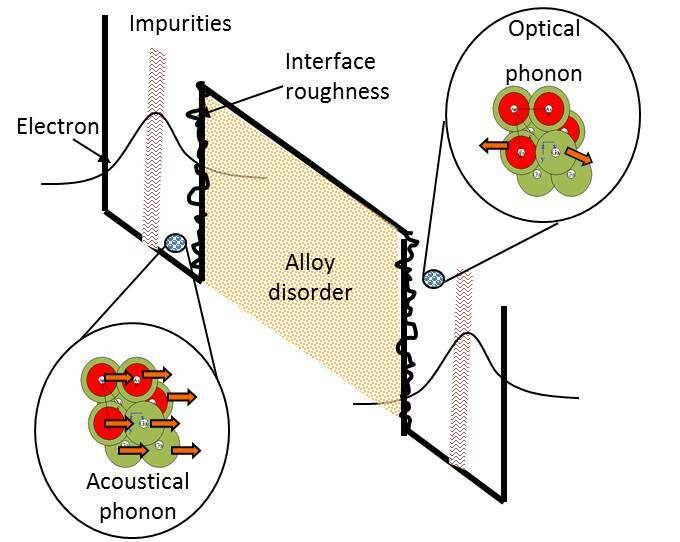 Impact of dimentionality and confinement on the electronic properties of mercury chalcogenides nanocrystals, C. Greboval, E. Izquierdo, C. Livache, B. Martinez, M. Dufour, N. Goubet, N. Moghaddam, J. Qu, A. Chu, J. Ramade, H. Aubin, H. Cruguel, M. Silly, E. Lhuillier, S. Ithurria, Nanoscale (2019). 63.Road Map for Nanocrystal based Infrared Photodetectors, C. Livache, B. Martinez, N. goubet, J. Ramade and E. Lhuillier, Frontiers In Chemitry 6, 575 (2018). 62. Polyoxometalate as Control Agent for the Doping in HgSe Self-Doped Nanocrystals, B. Martinez, C. Livache, E. meriggio, X. Z. Xu, H. Cruguel, E. Lacaze, A. Proust, S. Ithurria, M. G. Silly, G. Cabailh, F. Volatron, E. Lhuillier, J. Phys Chem C 122, 26680–26685 (2018). 61. Design of Unipolar Barrier for Nanocrystal Based Short Wave Infrared Photodiode, A.Jagtap, B. Martinez, N. Goubet, A. Chu, C. Livache, C. Greboval, j. ramade, D. Amelot, P. trousset, A. triboulin, S. Ithurria, M. G. Silly, B. Dubertret, E. Lhuillier, ACS photonics 5, 4569 (2018). 58. Short wave infrared devices based on HgTe nanocrystals with air stable performances, A. Jagtap, Nicolas Goubet, C. Livache, A. Chu, B. Martinez, C. Gréboval, J. Qu, E. Dandeu, L. Becerra, S. Ithurria, F. Mathevet, M. Silly, B. Dubertret, E. Lhuillier, J. Phys Chem C 122, 14979 (2018). 56. 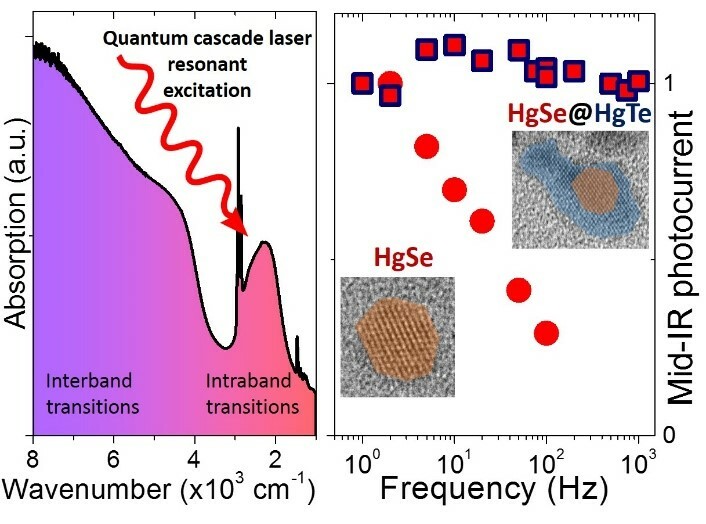 Coupled HgSe colloidal quantum wells through a tunable barrier : a strategy to uncouple optical and transport band gap, E. Izquierdo, M. Dufour, A. Chu, C. Livache, B. Martinez, D. Amelot, G. Patriarche, N. Lequeux, E. Lhuillier, and S. Ithurria, Chem Mat 30, 4065 (2018). 55. Terahertz HgTe nanocrystals : beyond confinement, N. Goubet, A. Jagtap, C. Livache, B. Martinez, H. Portales, X. Zhen Xu, R.P.S.M. Lobo, B. Dubertret, E. Lhuillier, J. Am. Chem. Soc. 140, 5033(2018). 54. 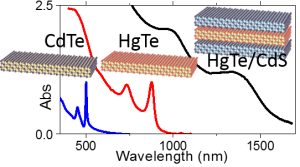 Electronic Structure in Two-Dimensional WS2/Graphene van der Waals Heterostructures : Work Function, Spin-Orbit Coupling and Band Alignment, H. Henck, Z. Ben Aziza, F. Laourine, M. G. Silly, D. Pierucci, F. Bertran, P. Le Fevre, E. Lhuillier, J. E. Rault, M. Calandra, A. Ouerghi, Phys. Rev. B 97, 155421 (2018). 53. Emergence of intraband transitions in colloidal nanocrystals, A. Jagtap, C. Livache, B. Martinez, J. Qu, Audrey Chu, C. Gréboval, N. Goubet, E. Lhuillier, Opt. Mater. Express 8(5), 1174-1183 (2018). 52. 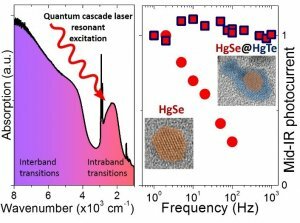 Band Edge Dynamics and Multiexciton Generation in Narrow Band Gap HgTe Nanocrystals, C. Livache, N. Goubet, B. Martinez, A. Jagtap, J. Qu, S. Ithurria, M. G. Silly, B. Dubertret, E. Lhuillier, ACS Appl. Mater. Interfaces 10, 11880–11887 (2018). 51.Strategy to overcome recombination limited photocurrent generation in CsPbX3 nanocrystal arrays, W. J. Mir, C. Livache, N. Goubet, B. Martinez, A. Jagtap, A. Chu, N. Coutard, H. Cruguel, T. Barisien, S. Ithurria, A. Nag, B. Dubertret, A. Ouerghi, M. G. Silly, E. Lhuillier, Appl. Phys. Lett. 112, 113503 (2018). 50. 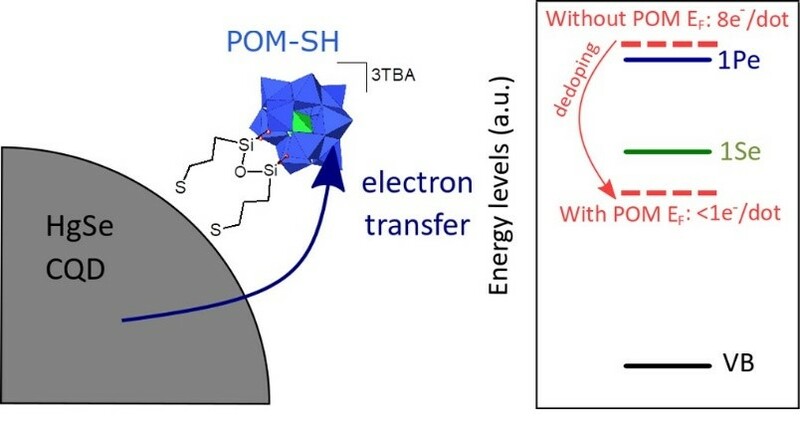 Fine Structure of Excitons and electron-hole exchange energy in Polymorphic CsPbBr3 Single Nanocrystals, J.Ramade, L. Andriambariarijaona, V. Steinmetz, N. Goubet, L. Legrand, T. Barisien, F. Bernardot, C. Testelin, E. Lhuillier, A. Bramati, M. Chamarro, Nanoscale 10, 6393 (2018). 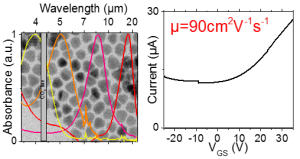 49.Electron-phonon coupling in a CsPbBr3 single Nanocrystal, J. Ramade, L. Marcel Andriambariarijaona, V. Steinmetz, L. Legrand, T. Barisien, F. Bernardot, C. Testelin, E. Lhuillier, N. Goubet, A. Bramati, M. Chamarro, Appl. Phys. Lett. 112, 072104 (2018). 47. Probing Charge Carrier Dynamics to Unveil the Role of Surface Ligands in HgTe Narrow Band Gap Nanocrystals, B. Martinez, C. Livache, N.Goubet, A. Jagtap, H. Cruguel, A. Ouerghi, E. Lacaze, M. G. Silly, E. Lhuillier, J. Phys. Chem. C, J. Phys. Chem. C, 2018, 122 (1), pp 859–865. 46. 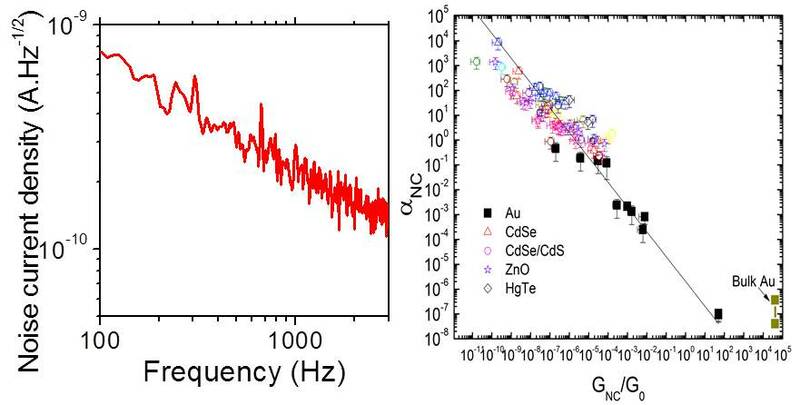 Engineering Bicolor Emission in 2D Core/crown CdSe/CdSe1-xTex Nanoplatelet Heterostructures Using Band-Offset Tuning, M. Dufour, V. Steinmetz, E. Izquierdo, T. Pons, N. Lequeux, E. Lhuillier, G. Patriarche, M. Chamarro, T. Barisien, S. Ithurria, J Phys Chem C 121, 24816–24823 (2017). 45. 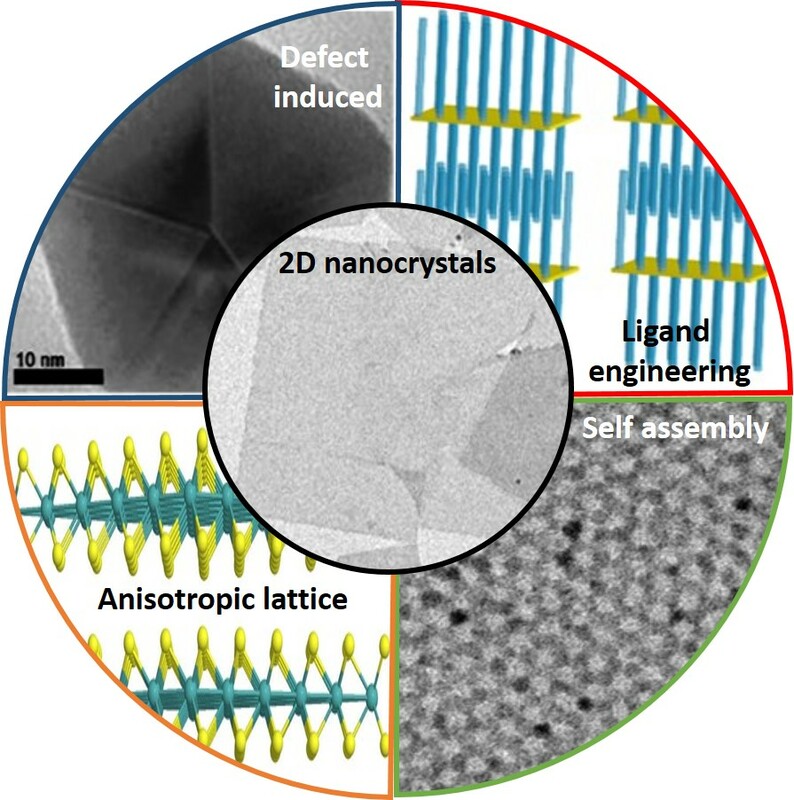 HgSe self-doped nanocrystals as a platform to investigate the effects of vanishing confinement, B. Martinez, C. Livache, L. D. Mouafo Notemgnou, N. Goubet, S. Keuleyan, H. Cruguel, S. Ithurria, H. Aubin, A. Ouerghi, B. Doudin, E. Lacaze, B. Dubertret, M. G. Silly, R. PSM Lobo, J.F. Dayen, E. Lhuillier., ACS appl. Mat. Inter. 9, 36173 (2017). 44. 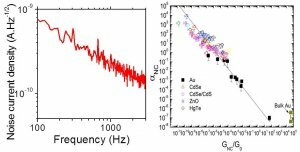 Interface Dipole and Band Bending in Hybrid p-n Heterojunction MoS2/GaN(0001), H. Henck, Z. Ben Aziza, O. Zill, D. Pierucci, C. H. Naylor, M. G. Silly, N. Gogneau, F. Oehler, S. Collin, J. Brault, F. Sirotti, F. Bertan, P. Lefèvre, S. Berciaud, A.T Charlie Johnson, E. Lhuillier, J. E. Rault, A. Ouerghi, Phys Rev B 96, 115312 (2017). 43. 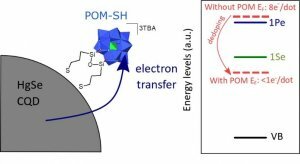 Negatively charged and dark excitons in CsPbBr3 perovskite nanocrystals revealed by high magnetic fields, D. Canneson, E. V. Shornikova, D. R. Yakovlev, T. Rogge, A. A. Mitioglu, M. V. Ballottin, P. C. M. Christianen, E. Lhuillier, M. Bayer, L. Biadala, Nano Lett 17, 6177 (2017). 42. Control of carrier density in (Sb ;Bi)2Te3 colloidal heterostructured nanoplates, W. J. Mir, A. Assouline C. Livache, B. Martinez, N. Goubet, X. Z. Xu, G. Patriarche, S. Ithurria, H. Aubin, E. Lhuillier, Sci Rep 7, 9647 (2017). 41. 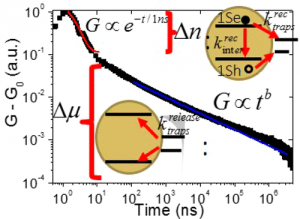 Charge dynamics and optolectronic properties in HgTe colloidal quantum wells, C. Livache, E. izquierdo, B. Martinez, M. Dufour, S. Keuleyan, D. Pierruci, H. Cruguel, L. Becerra, J.-L. Fave, H. Aubin, A. Ouerghi, E. Lacaze, M. Silly, B. Dubertret, S. Ithurria, E. Lhuillier, Nano Lett 17, 4067 (2017). paper has been highlithed by synchrotron Soleil. paper has been highlighted by INSP. 40. Electronic structure of CdSe-ZnS 2D nanoplatelets, H. Cruguel, C. Livache, B. Martinez, S. Pedetti, D. Pierruci, E. izquierdo, M. Dufour, S. Ithurria, H. Aubin, A. Ouerghi, E. Lacaze, M. Silly, B. Dubertret, E. Lhuillier, Appl. Phys. Lett. 110, 152103 (2017). 39. 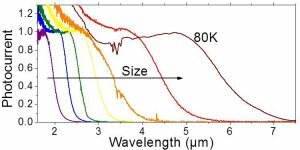 Recent Progresses in Mid Infrared Nanocrystal based Optoelectronics, E. Lhuillier, P. Guyot Sionnest, IEEE J Selec Top Quantm Elec 23, 1 (2017). 38. 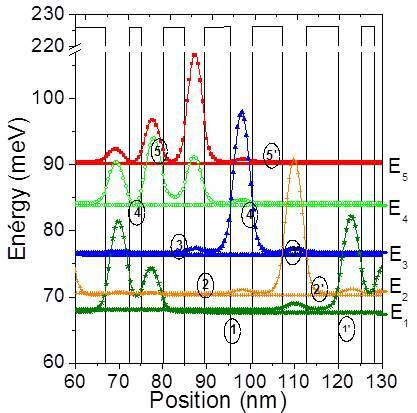 Correlated blinking of fluorescent emitters mediated by single plasmons, D. Bouchet, E. Lhuillier, S. Ithurria, A. Gulinatti, I. Rech, R. Carminati, Y. De Wilde, V. Krachmalnicoff, Phys Rev A 95, 033828 (2017). 37. Transport in a Single Self-Doped Nanocrystal, H. Wang, E. Lhuillier, Q. Yu, A. Zimmers, B. Dubertret, C. Ulysse and H. Aubin, ACS Nano 11, 1222 (2017). 36. Two-dimensional layered GaSe/Graphene Van der Waals Heterostructure : Electronic and Interfacial Properties, Z. Ben Aziza, H. Henck, D. Pierucci, M. G. Silly, E. Lhuillier, G. Patriarche, F. Sirotti, M. Eddrief, A. Ouerghi, ACS Nano 10, 9679 (2016). 35. Surface Control of Doping in self-doped Nanocrystals, A. Robin, C. Livache, S. Ithurria, E. Lacaze, B. Dubertret, E. Lhuillier, ACS Appl. Mat. Interface 8, 27122 (2016). 34. 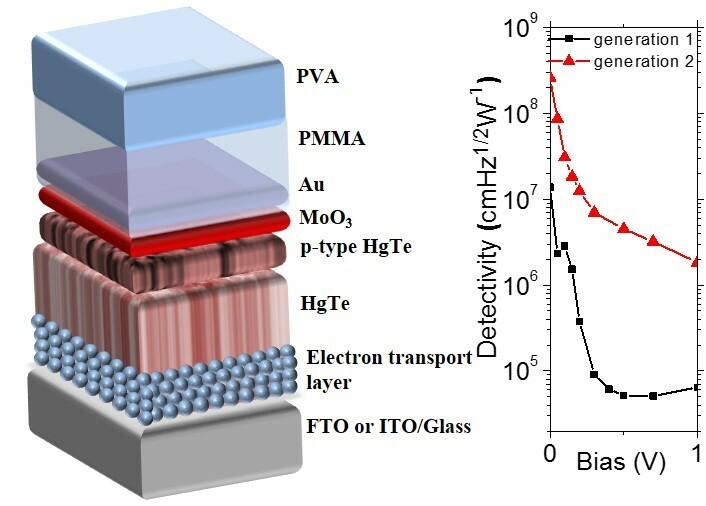 Electrolytic phototransistor based on graphene-MoS2 van der Waals p-n heterojunction with tunable photoresponse, H. Henck, D. Pierucci, J. Chaste, C. H. Naylor, J. Avila, A. Balan, M. G. Silly, M. C. Asensio, F. Sirotti, A.T C. Johnson, E. Lhuillier* and A. Ouerghi*, Appl. Phys. Lett. 109, 113103 (2016). 33. 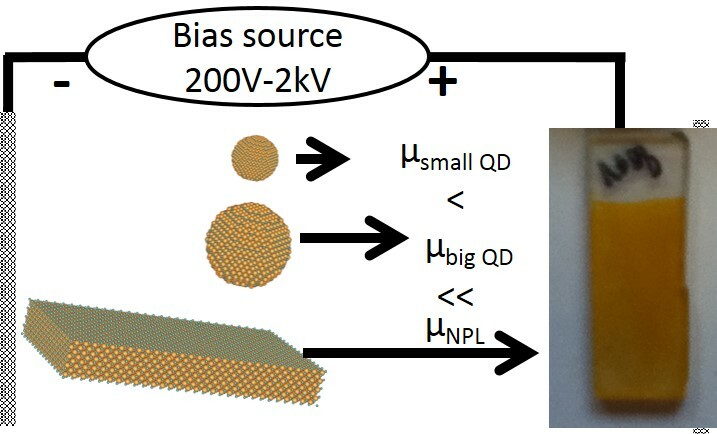 Non-destructive encapsulation of CdSe/CdS quantum dots in an inorganic matrix by pulsed laser deposition, A. Aubret, J. Houel, A. Pereira, J. Baronnier, E. Lhuillier, B. Dubertret, C. Dujardin, F. Kulzer, A. Pillonnet, ACS Appl Mater Interfaces 8, 22361 (2016). 32. 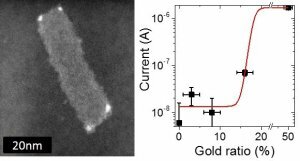 Strongly confined HgTe 2D nanoplatelets as narrow near infrared emitter, E. Izquierdo, A. Robin, S. Keuleyan, N. Lequeux, E. Lhuillier, S. Ithurria, JACS 138, 10496 (2016). 31. Nanocristaux colloïdaux pour l’optoélectronique, E. Lhuillier, B. Dubertret, Techniques de l’ingénieur 2016. 30. 2D Colloidal nanocrystals, M. Nasilovski, B. Mahler, E. Lhuillier, S. Ithurria, B. Dubertret, Chem Rev. 116, 10934−10982 (2016). 29. Metallic Functionalization of CdSe 2D Nanoplatelets and Its Impact on electronic Transport, B. Mahler, L. Guillemot, L. Bossard Giannesini, S. Ithurria, D. Pierucci, A. Ouerghi, G. Patriarche, R. Benbalagh, E. Lacaze, F. Rochet, and E. Lhuillier, J. Phys Chem C 120, 12351-12361 (2016). 28. 8. 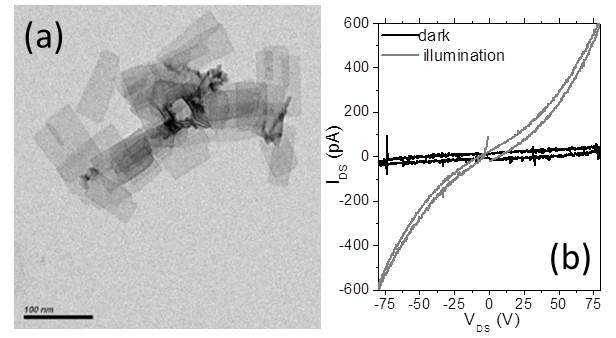 Large area molybdenum disulphide epitaxial graphene vertical Van der Waals heterostructures, D. Pierucci, H. Henck, H. Sediri, E. Lhuillier, A. Balan, J. E. Rault, Y. J. Dappe, F. Bertran, P. Le Fevre, A. Ouerghi, Sci. Rep 6, 26656 (2016). 27. Engineering the Charge Transfer in all 2D Graphene-Nanoplatelets Heterostructure Photodetectors, A. Robin, E. Lhuillier, X. Z. Xu, S. Ithurria, H. Aubin, A. Ouerghi, and B. Dubertret, Sci. Rep. 6 , 24909 (2016). 26. 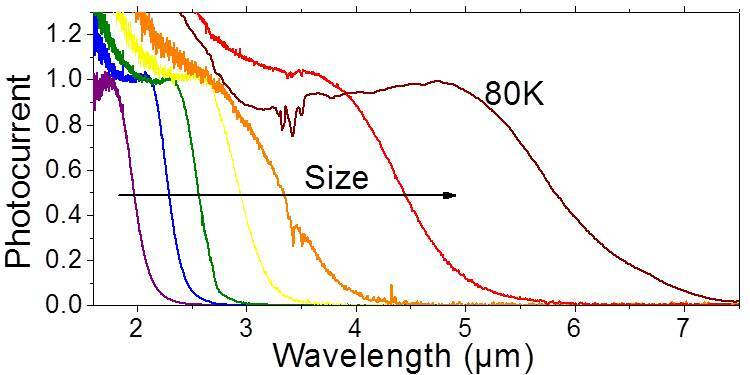 Infrared photo-detection based on colloidal quantum-dot films with high mobility and optical absorption up to the THz, E. Lhuillier, M. Scarafagio, P. Hease, B. Nadal, H. Aubin, X. Z. Xu, N. Lequeux, G. Patriache, S. Ithurria, B. Dubertret, Nano Lett 16, 1282 (2016). 25. Investigating the n and p type electrolytic charging of colloidal nanoplatelets, E.Lhuillier, S. Ithurria, A. Descamps-Mandine, T. Douillard, R. Castaing, X.Z. Xu, P-L. Taberna, P. Simon, H. Aubin, B. Dubertret, J Phys Chem C 119, 21795 (2015). 23. 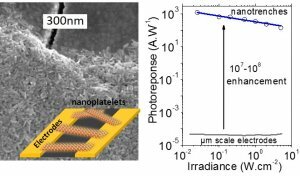 Nanoplatelets Bridging a Nanotrench : A New Architecture for Photodetectors with Increased Sensitivity, Emmanuel Lhuillier, Jean-Francois Dayen, Daniel O. Thomas, Adrien Robin, Bernard Doudin, Benoit Dubertret, Nano Lett 15, 1736 (2015). 22. 2D Colloidal Metal Chalcogenides Semiconductors : Synthesis, Spectroscopy and Applications, E. Lhuillier, S. Pedetti, S. Ithurria, B. Nadal, H. Heuclin, B. Dubertret, Accounts for chemical research 22, 48 (2015). 21. Autocorrelation analysis for the unbiased determination of power-law exponents in single-quantum-dot blinking, J. Houel, Q. T. Doan, T. Cajgfinger, G. Ledoux, D. Amans, A. Aubret, A. Dominjon, S. Ferriol, R. Barbier, M. Nasilowski, E. Lhuillier, B. Dubertret, C. Dujardin, F. Kulzer, ACS Nano 9, 886 (2015) - arxiv.org/pdf/1410.8847. 20. 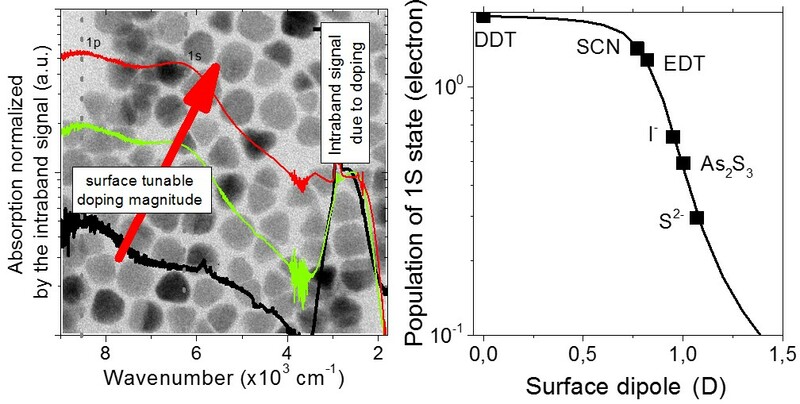 Selective Electrophoretic Deposition of CdSe Nanoplatelets, E. Lhuillier, P. Hease, S. Ithurria, B. Dubertret, Chem Mat 26, 4514 (2014). 19. 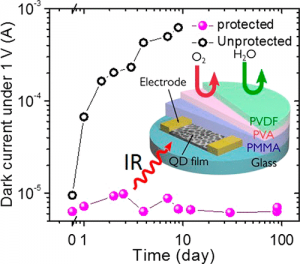 Electrolyte gated colloidal nanoplatelets based phototransistor and its use for bicolor detection, E. Lhuillier, A. Robin, S. Ithurria, H. Aubin, B. Dubertret, Nano Lett. 14, 2715(2014). 17. 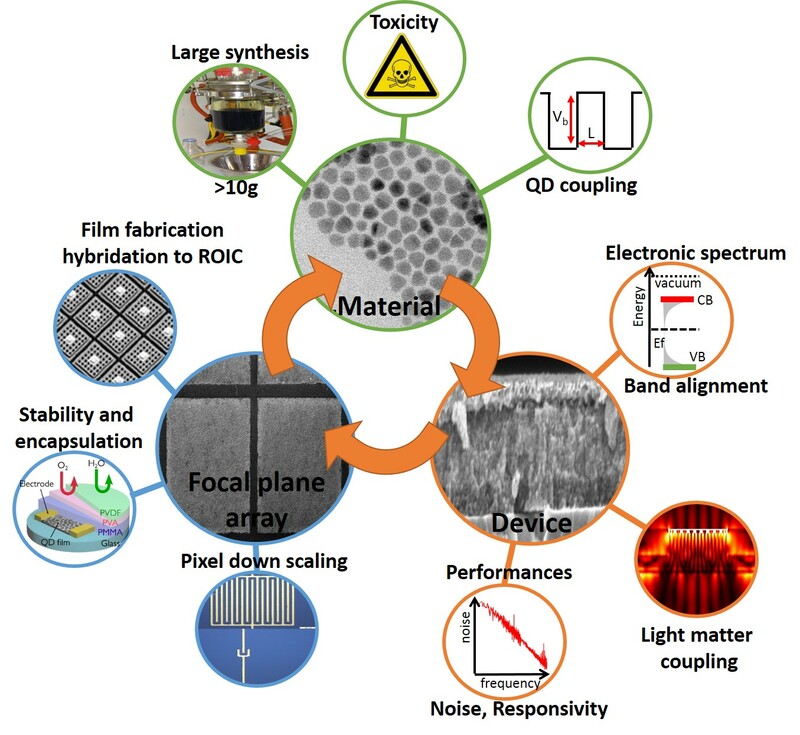 Electrolyte Gated Field Effect Transistor to Probe the Surface Defects and Morphology in Films of Thick CdSe Colloidal Nanoplatelets, E. Lhuillier, S. Pedetti , S. Ithurria, H. Heuclin, B. Nadal, A. Robin, G. Patriarche , N. Lequeux and B. Dubertret, ACS nano 8, 3813(2014). 16. Optimized Synthesis of CdTe Nanoplatelets and Photoresponse of CdTe Nanoplatelets Films, S.Pedetti, B. Nadal, E. Lhuillier, B. Mahler, C. Bouet, B. Abécassis, X. Xu, B. Dubertret, Chem. Mat 25, 2455 (2013). 15. 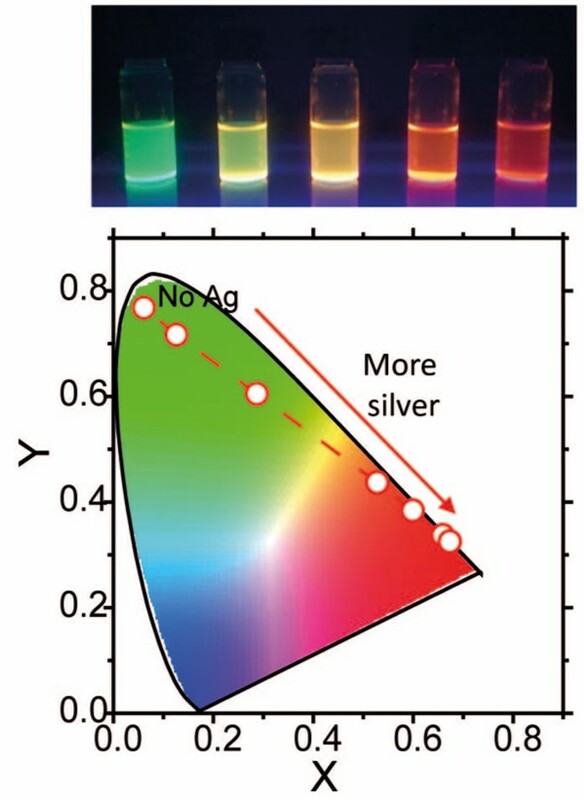 HgTe quantum dot for mid IR application, E. Lhuillier, S. Keuleyan, H Liu and P. Guyot-Sionnest, Chem. Mat 25, 1272 (2013). 14. Mid-Infrared HgTe/As2S3 FETs and photodetectors, E. Lhuillier, S. Keuleyan, P. Zolotavin and P. Guyot-Sionnest, Adv. Mat. 25, 137 (2013). 13. A « mirage » study of CdSe colloidal quantum dot films, Urbach tail and surface states, P. Guyot-Sionnest, E. Lhuillier, and H. Liu, J. Chem. Phys. 137, 154704 (2012). 12. 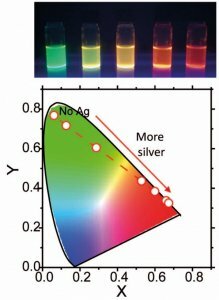 Optical properties of HgTe colloidal quantum dots, E. Lhuillier, S. Keuleyan and P. Guyot-Sionnest, Nanotechnology 23, 175705 (2012). 11. Saw tooth patterns on the I(V) curve of quantum well infrared photodetectors : from modeling to the impact on the detector performance, E. Lhuillier, V. Guériaux, V. Trinité and M. Carras, IEEE J. quant .Elec 48, 665(2012). 10. 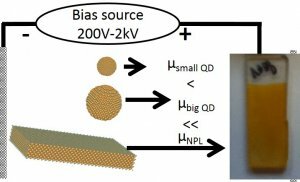 Synthesis of Colloidal HgTe Quantum Dots for Narrow Mid-IR Emission and Detection, S. Keuleyan, E. Lhuillier and P. Guyot-Sionnest, J. Am. Chem. Soc. 133, 16422 (2011). 9. 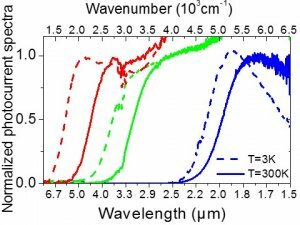 Thermal properties of mid infrared Colloidal quantum dot detectors, E. Lhuillier, S. Keuleyan, P. Rekemeyer and P. Guyot-Sionnest, J. Appl. Phys 110, 032110 (2011). 8. 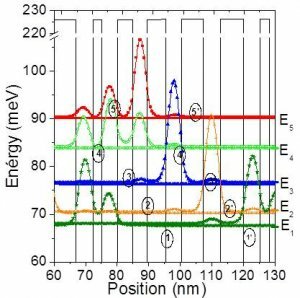 Mid-infrared HgTe colloidal quantum dot photodetectors, S. Keuleyan, E. Lhuillier, V. Brajuskovic and P. Guyot-Sionnest, Nat Photon 5, 489-493. (2011). 7. Quantum scattering engineering of quantum well infrared photodetectors in the tunnelling regime, E. Lhuillier, E. Rosencher, I. Ribet-Mohamed, A. Nedelcu, L. Doyennette, V. Berger, J. App. Phys. 108, 113707 (2010). 6. 15µm Quantum well infrared photodetector for thermometric imagery in cryogenic windtunnel, E. Lhuillier, I. Ribet-Mohamed, N. Péré-Laperne, M. Tauvy, J. Deschamps, A. Nedelcu, E. Rosencher, Infrared phys. tech. 53, 425 (2010) (arXiv:1003.2310v1). 5. Quantum well infrared photodetectors hardiness to the non ideality of the energy band profile, E. Lhuillier, N. Pere-Laperne, I. Ribet-Mohamed, E. Rosencher, G. Patriarche, A. Buffaz, V. Berger, A. Nedelcu, M. Carras, J. Appl. Phys. 107, 123110 (2010) (arXiv:1002.3543v2). 4. Low temperature quantum transport in weakly coupled superlattices, E. Lhuillier, I. Ribet-Mohamed, A. Nedelcu, V. Berger and E. Rosencher, Phys. Rev. B 81, 155305 (2010). 3. 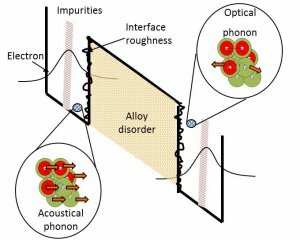 Interface roughness transport in THz quantum cascade detectors E. Lhuillier, I. Ribet-Mohamed, E. Rosencher, G. Patriarche, A. Buffaz, V. Berger, and M. Carras, App. Phys. Lett. 96, 061111 (2010). 2. 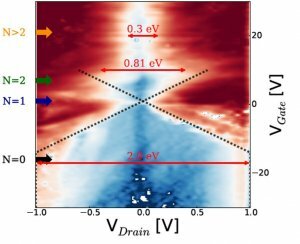 Modeling of dark current in midinfrared quantum well infrared photodetectors, F. Castellano, F. Rossi, J Faist, E. Lhuillier and V. Berger, Phys. Rev. B 79, 205304 (2009). 1. Ultimate performance of Quantum Well Infrared Photodetectors in the tunneling regime, E. Lhuillier, I. Ribet-Mohamed, M. Tauvy, A. Nedelcu, V. Berger and E. Rosencher, Infrared phys. tech. 52, 132-137 (2009). 1. 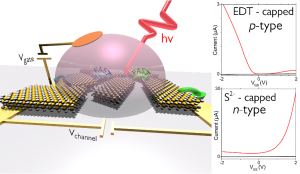 Quantum transport in Quantum Well Infrared Photodetectors in the tunneling regime, E. Lhuillier, I. Ribet-Mohamed, A. Nedelcu, V. Berger and E. Rosencher, Infrared phys. tech. 52, 247 (2009). (QSIP 2009 conference paper). 2. 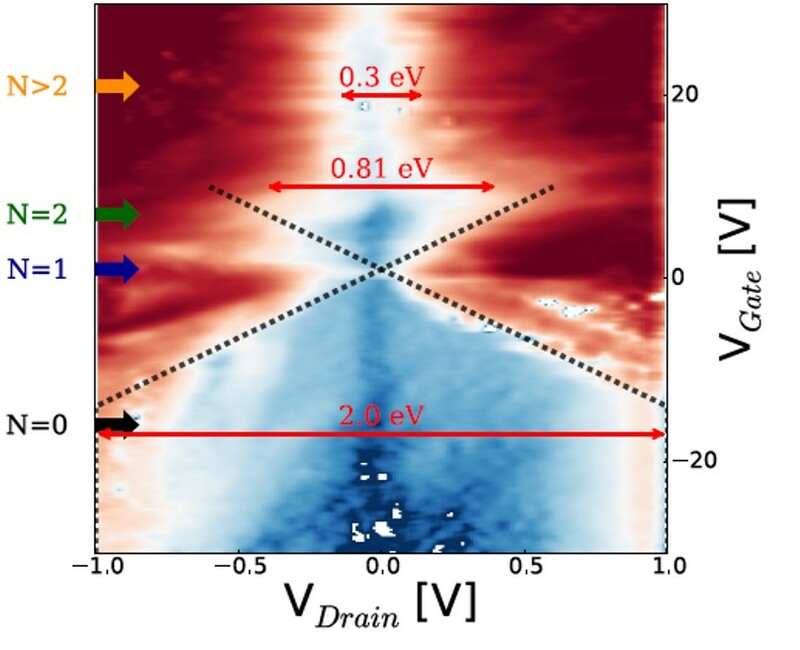 Modeling of dark current in mid-infrared quantum-well infrared photodetectors, F. Castellano, R. C. Iotti, F. Rossi, J. Faist, E. Lhuillier, V. Berger Infrared phys. tech. 52, 220 (2009). (QSIP 2009 conference paper). 3. Dark current reduction in high wavelength quantum well infrared photodetector operating at low temperature, E. Lhuillier, N. Péré-Laperne, E. Rosencher, I. Ribet-Mohamed, A. Nedelcu, L. Doyennette, V. Berger, Infrared phys. Tech 54, 189 (2011). (QSIP 2010 conference paper). 4. Colloidal HgTe material for low cost detection into the MWIR, E. Lhuillier, S. Keuleyan, H. Liu and P. Guyot-Sionnest, II VI conference, Chicago, october 2011. J. Elec. Mat 40, (2012). 5. 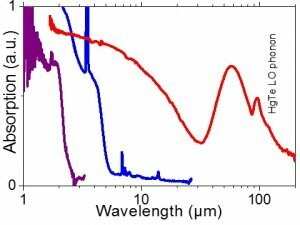 Transport properties of mid-infrared colloidal quantum dot films, E. Lhuillier, S. Keuleyan and P. Guyot-Sionnest, Proc. SPIE 8271, 827109 (2012). 6. Colloidal quantum dots for mid-infrared detection, P. Guyot-Sionnest, S. Keuleyan, H. Liu, and E. Lhuillier, proc SPIE 8268, 82682Z (2012). 7. Colloidal quantum dot for mid-IR applications, E. Lhuillier, S. Keuleyan and P. Guyot-Sionnest, Infrared phys. Tech. 59, 133 (2013) (QSIP 2012 conference paper). 10. Intraband transition in self-doped narrow band gap colloidal quantum dots, B. Martinez, C. Livache, A. Robin, H. Cruguel, S. Royer, X. Z. Xu, H. Aubin, S. Ithurria, E. Lhuillier, Proc SPIE (2017). 11. Shape and confinement control in mid and far infrared nanocrystals, C.Livache, B. Martinez, E. Izquierdo, M. Dufour, H. Cruguel, S. Royer, X.Z. Xu, S. Ithurria, E. Lhuillier, Proc SPIE (2017). 12. Investigation of the self-doping process in HgSe nanocrystals, C. Livache, B. Martinez, A. Robin, N. Goubet, B. Dubertret, H. Wang, S. Ithurria, H. Aubin, E. Lhuillier, Phys Stat Solid A in press (2017). 13. Optoelectronics using 2D colloidal nanocrystals from wide band gap to narrow band gap materials, B. Martinez, C. Livache, N. Goubet, E. Izquierdo, M. G Silly, S. Ithurria, E. Lhuillier, Phys Stat Solid C in press (2017). 1. 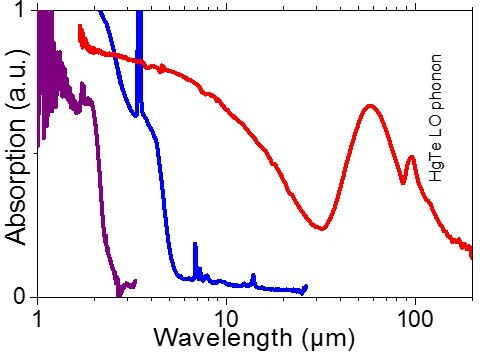 Mid-infrared photodetectors, P. Guyot Sionnest S. Keuleyan, E. Lhuillier, WO 2012162246 A2 (2012). 2. Supercapacitor like electronic battery, E. Lhuillier, B. Dubertret, numero demande 12170169.0-1359(2013). 3. Large capacitance electronic components, E. Lhuillier, B. Dubertret, numero demande 13170171.6-1552 (2013). 4. Electronic devices comprising nanogap electrodes and nanoparticles, E. Lhuillier, B. Dubertret, (2014) - EP14165507.6. 5. Core-shell nanoplatelets film and display device using the same, H. Heuclin, B. Nadal, C. Grazon, B. Mahler, E. Lhuillier (2015). 1. 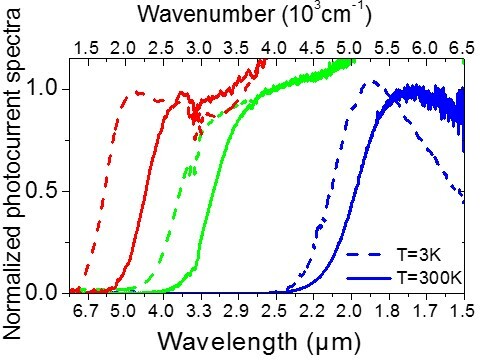 Osez l’optoélectronique infrarouge, E. Lhuillier, S. Keuleyan, P. Guyot Sionnest and J. Jaeck, Photoniques (juin 2012).